Identification: Moyle (1976a); Sigler and Sigler (1987); Page and Burr (1991). Native Range: Sacramento--San Joaquin, Pajaro, and Salinas River drainages, and Clear Lake in Lake County, California (Moyle 1976a; Page and Burr 1991). Table 1. States with nonindigenous occurrences, the earliest and latest observations in each state, and the tally and names of HUCs with observations†. Names and dates are hyperlinked to their relevant specimen records. The list of references for all nonindigenous occurrences of Archoplites interruptus are found here. Means of Introduction: Intentional stocking for sportfishing. The earliest introduction of Sacramento Perch took place circa 1877, into western Nevada (McCarraher and Gregory 1970). Nebraska, North Dakota, Colorado, New Mexico, Texas, and Arizona were all stocked in the 1960s (McCarraher and Gregory 1970). Sacramento Perch were discovered in Crowley Lake, California in the late 1960s, but the exact date and reason for the introduction is not known (McCarraher and Gregory 1970). Status: According to McCarraher and Gregory (1970), survival has been poor in most states. Small numbers still persist in private lakes near Fort Collins, Colorado (Walker 1993). No longer present in Walker Lake, Nevada (Sigler and Sigler 1987). Probably extirpated in Arizona. It was known to have reproduced at least once in that state after its introduction in 1968 (Minckley 1973). Extirpated in New Mexico (Sublette et al. 1990). 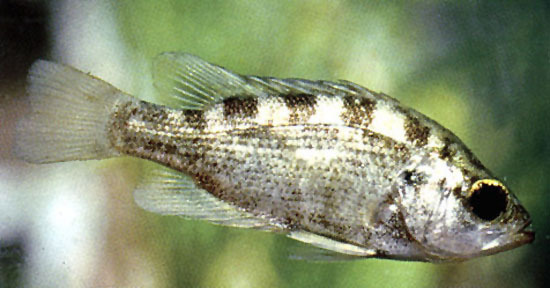 Impact of Introduction: Introduced Sacramento Perch, along with many other introduced fishes, may have contributed to the decline of the Lost River sucker Deltistes luxatus and the shortnose sucker Chasmistes brevirostris in the upper Klamath drainage in Oregon (U.S. Fish and Wildlife Service 1993). Remarks: This is the only native centrarchid west of the Rockies. It is declining in its native range due to competition with introduced species (Moore 1968; McCarraher and Gregory 1970; Minckley 1973). U.S. Fish and Wildlife Service. 1993. Lost River (Deltistes luxatus) and shortnose (Chamistes brevirostris) sucker recovery plan. U.S. Fish and Wildlife Service, Portland, Oregon.